One of the most important artists of the twentieth century, Kandinsky was a founding member of Der Blaue Reiter group and one of the first to begin moving towards pure abstraction. His works are to be found in every important museum in Europe and America. In Klange / Sounds, he combined poetry with woodcut to suggest the equivalence of the visible and the audible ("Heard melodies are sweet, but those unheard are sweeter," said Keats; Kandinsky might have agreed). In these woodcuts, one can see him leaving his Russian folk-art roots behind as the images he presents become less and less representational. Klange represents one of the turning points in western art. As Hans K. Roethel says in The Graphic Work of Kandinsky: A Loan Exhibition (NY: The International Exhibitions Foundation, 1974), "a seemingly disproportionate number of examples from the year 1911 have been included in this exhibition. The reason for this is that it was the most productive year in Kandinsky's whole life from the point of view both of the quality and the quantity of his work." Almost all these works were done for Klange (published in 1913 by R. Piper in Munich in an edition of 345 impressions) and manifest the process by which his art ceased to be devoted to a subject outside of the art and instead became a quest for a balance of form and color within the art (evenperhaps especially in the black and white woodcuts). A number of these works were translations of paintings into woodcuts and, Roethel observes, "in most cases the graphic transformation [as he himself said] turned out to be 'better than the painting.' " Later in his life, Kandinsky began to feel very strongly that these works were too little known and he began publishing selections in deluxe art reviews like Cahiers d’Art and XXe Siécle. 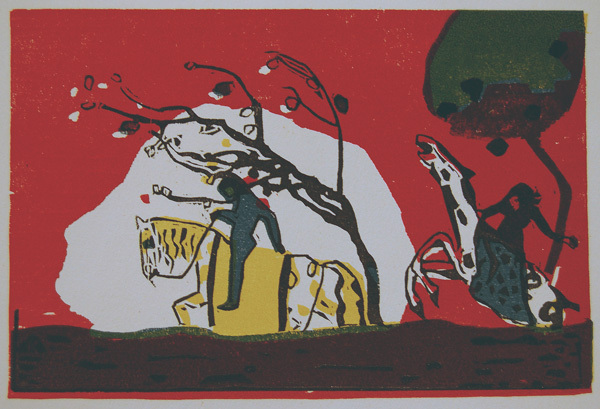 The six woodcuts below were printed under his supervision for publication in a 1938 issue of XXe Siécle After his death, his widow, Nina Kandinsky continued the practise, and allowed Galerie Maeght, to whom she had entrusted the exhibition and sale of Kandinsky's paintings and watercolors, to publish several of his woodcuts for Klange in Derriere le Miroir; she also allowed the publication of four more in a special issue of XXe Siécle published as an Homage to Kandinsky. 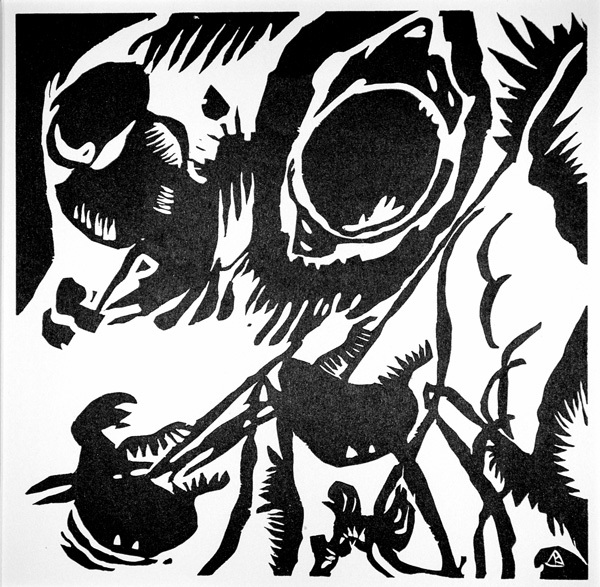 Finally in 1971, she allowed a deluxe printing of 10 of the Klange woodcuts (five in color and five in black and white) in a reprint of one of his theoretical texts, Regard sur le Passé (Rückblicke). In this boxed set of unbound pages printed on large sheets (380x280mm) of Arches paper published in an edition of 100 portfolios (the first 40 also contained a set on Japon paper) signed by her on the justification page and numbered, she choose seven woodcuts (4 in color) that had not been elsewhere reprinted along with three also found in the 1966 Homage to Kandinsky. Each of these here appears in with a specially-made signature drystamp (a K inside a triangle) similar to the signature Kandinsky cut into his woodblocks. There are no pencil-signed impressions of any of the Klange woodcuts. The Archer (Roethel 79). Original color woodcut, 1908-1909. Edition: 60 impressions for the deluxe edition of Der Blaue Reiter almanac + c. 1200 proofs printed in XXe Siecle in 1938 under Kandinsky's supervision. 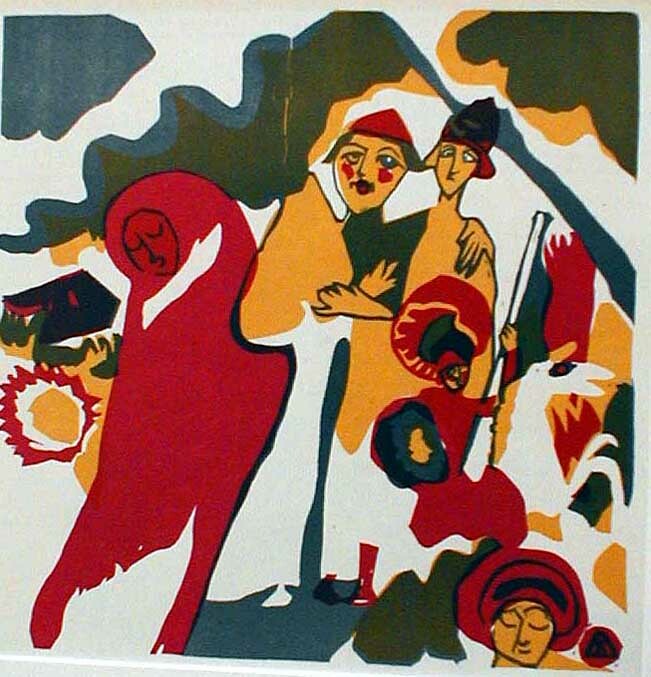 Another impression of this print (also from the 1938 XXe Siecle edition) is illustrated in Vivian Endicott Barnet, Kandinsky at the Guggenheim (NY: Solomon R. Guggenheim Museum, 1983), p. One of Kandinsky's richest woodcuts. Image size: 164x153mm. Price: $4500. Zwei Reiter vor Rot / Two riders on a red background (Roethel 95, Davis-Rifkind 1368: 1). Original color woodcut, 1911. Edition: 345 impressions signed in the block with the monogram for Klange / Sounds (1913). C. 1200 proofs printed in XXe Siecle in 1938 under Kandinsky's supervision. Image size: 123x190mm. Price: $3750. Motif aus Improvisation 25: The Garden of Love (Roethel 105, Davis-Rifkind 1368: 6). Original woodcut, 1911. Edition: 345 impressions signed in the block with the monogram for Klange / Sounds (1913). 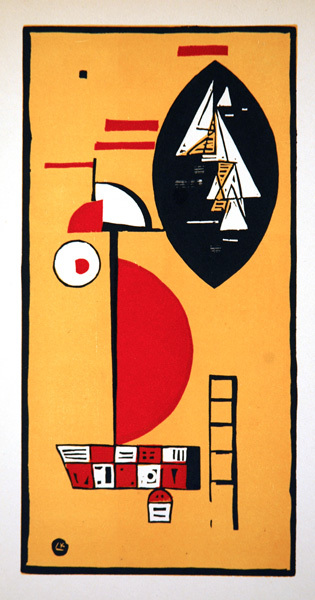 Ours is one of c. 1200 proofs printed in XXe Siecle in 1938 under Kandinsky's supervision. There was also an edition of c. 1200 impressions printed from the original block with the authorization of Kandinsky's widow. Nina, in 1955 (see Kandinsky 4). Illustrated in Roethel, The Graphic Work of Kandinsky: A Loan Exhibition (NY: The International Exhibitions Foundation, 1974), From Manet to Hockney: Modern Artists' Illustrated Books (Victoria and ALbert Museum), p. 131 and A Breadth of Vision: The Ritz Collection (Milwaukee Art Museum, 1992), p. 21. Image size: 216x219mm. Price: $3500. Kahn fahrt / Boat voyage (Roethel 115). Original color woodcut, 1911. Edition: 345 impressions signed in the block with the monogram for Klange / Sounds (1913). There was also an edition (from which our impression comes) of c. 1200 impressions printed from the original block with the authorization of Kandinsky's widow, Nina, in 1955. Illustrated in The Graphic Work of Kandinsky. 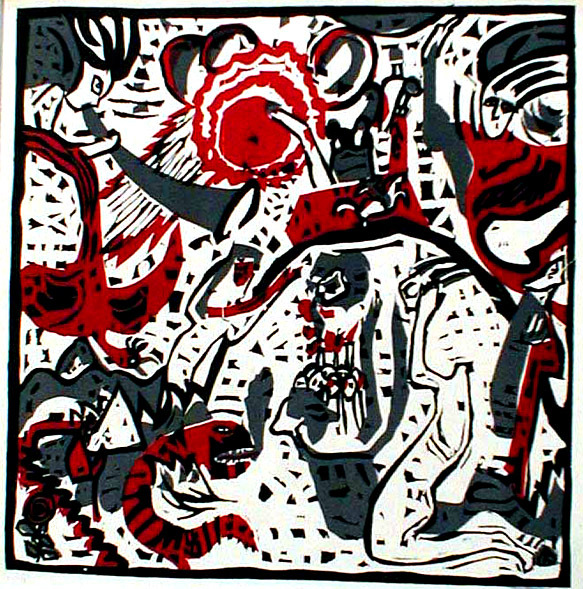 A reproduction of this woodcut was reproduced on the cover of a brochure published by the Madison Art Center for an exhibition entitled Madison Collects Modern Prints. Image size: 218x221mm. Price: $1275. Allerheiligen / All Saints Day (Roethel 131). Original color woodcut, 1911. Edition: 345 impressions signed in the block with the monogram for Klange / Sounds (1913). 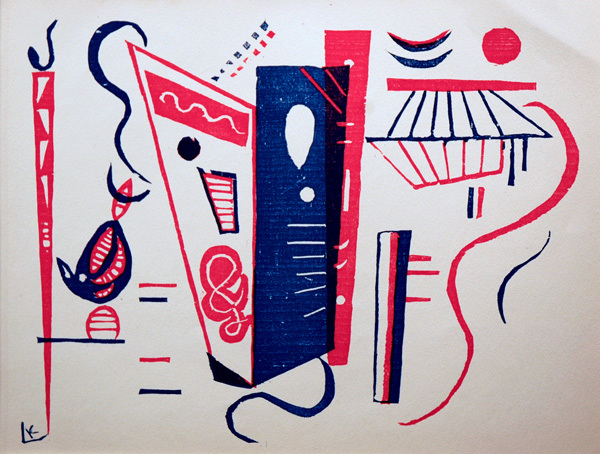 There was also an edition of c. 1200 impressions printed from the original block with the authorization of Kandinsky's widow, Nina, in 1951; our impression is from this edition. Illustrated in The Graphic Work of Kandinsky. Image size: 218x217mm. Price: $1275. Grosse Aufestehung / Great Resurrection (Roethel 138). Original color woodcut, 1911. Edition: 345 impressions signed in the block with the monogram for Klange / Sounds (1913). There was also an edition of c. 1200 impressions printed from the original block with the authorization of Kandinsky's widow. Nina, in 1951. 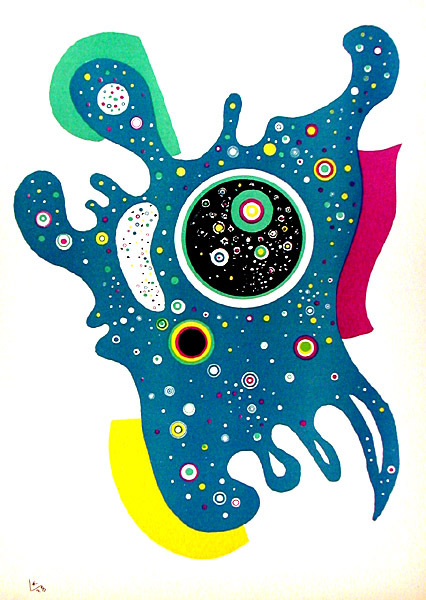 This image was included in an exhibition at the Museum of Modern Art on Modern Prints in Books. Image size: 219x218mm. Price: $1275. Composition for Cahiers d'Art (1930) (Roethel 193). 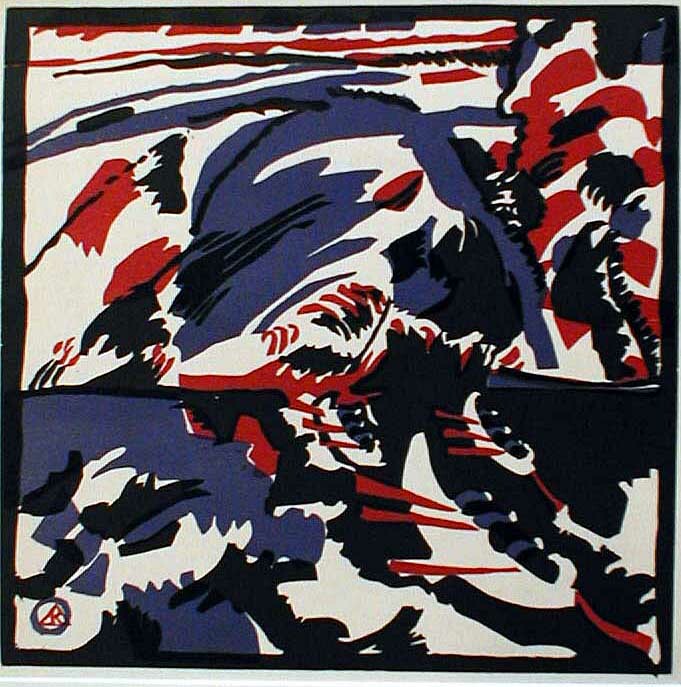 Original 3-color woodcut, 1930. Edition: 610 impressions for the deluxe art review Cahiers d'Art published in Paris in 1930. Monogrammed in the block lower left. 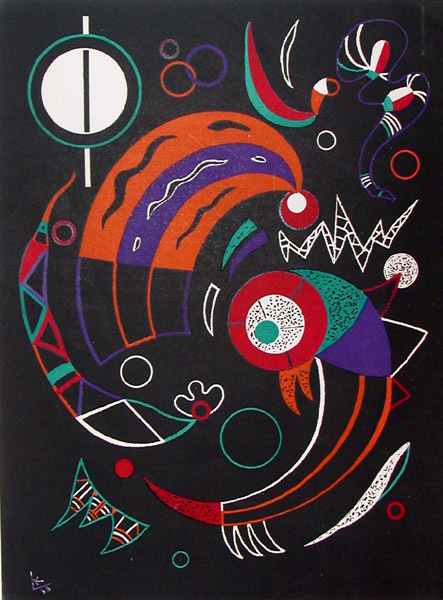 Illustrated in The Graphic Work of Kandinsky (ed. H. K. Roethel), the cataolgue of an exhibition at the Guggenheim, the Phillips Collection in Washington D.C., and 10 other museums. This is the only printing of this important late woodcut. Rare! Image size: 219x110mm. Price: $5750. Comets (Inventaire du Fonds Francais S. 5). Original color lithograph, 1938. Edition: as published in the deluxe art review, Verve, in 1938. Both the Grohman and Berggruen (Paris) catalogs list this work as an original lithograph. See Barnett 1216 for the gouache Kandinsky executed in preparation for this work. Signed with the monogram in the stone Image size: 354x260mm. Price: $1250. Stars (Inventaire du Fonds Francais S. 6). Original color lithograph, 1938. Edition: as published in the deluxe art review, Verve, in 1938. Both the Grohman and Berggruen (Paris) catalogs list this work as an original lithograph. Signed with the monogram in the stone. Image size: 354x260mm. Price: $1250. Composition fur XXe Siécle (Roethel 201). Original 2-color woodcut, 1939. Edition: published by the deluxe art review, XXe Siecle, in 1939. The edition was between 1000 and 1200 impressions, half of which were intended to be sold in Europe and half in the USA. The USA issue was prevented by the outbreak of the war and a large percentage of the whole edition was lost during the war. There are no signed and numbered impressions and no restrikes. Ours is a fine impression on thin wove paper in good condition except for a slight handling crease across the upper right corner. 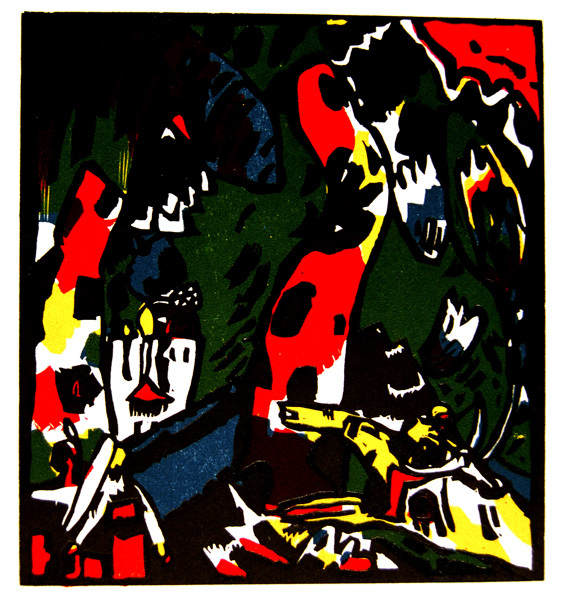 This is the only color woodcut Kandinsky made in the later period of his life. Illustrated in Roethel, The Graphic Work of Kandinsky: A Loan Exhibition (NY: The International Exhibitions Foundation, 1974) and Vivian Endicott Barnet, Kandinsky at the Guggenheim (NY: Solomon R. Guggenheim Museum, 1983), p. 291. This is the only printing of this important late woodcut. Rare! Image size: 210x170mm. Price: $4750.